Additionally, the stores (except the one @4th and 229 Elizabeth street) stock The Laundress. 11, WEST 56 STREET (between 5th and 6th Av). Besides the store also stocks Escentric Molecules and Frank Los Angeles. In theory with Solange' fragrances. Tom Ford Private Blend' line. Brands: 10 Corso Como, 19-69, Andy Tauer Perfumes, A Lab on Fire, Abel, Aether, Amouage, Andrea Maack, Andree Putman, Apothia, Aroma M, Arquiste, Atelier de Geste, Bottega Profumiera, Blocki Perfumes, Bruno Fazzolari, Beaufort London, Byredo, Bois 1920, Blackbird, Carlen Parfums, Carner Barcelona, CB I Hate perfume, Charenton Macerations, Cinnamon Projects, Comme des Garcons, Cire Trudon, Coolife, Dasein Fragrance, Dr. Vranjes, D.S&Durga, Escentric Molecules, Eight & Bob, Ephemera by Unsound, Etat Libre d'Orange, Ex Idolo, Egofacto*, Floris, Filippo Sorcinelli (incl. Sauf, UNUM), Fornasetti, Gallivant, Grossmith London, Heeley, Helmut Lang, Heretic Parfums, Hiram Green, Histoires de Parfums, I Profumi di Firenze, Inspiritv, Imaginary Authors, In Fiore, Ineke, Isabey, J. Lesquendieu, Jardins D'ecrivains, Joya, Jeroboam, Juliette Has A Gun, Juniper Ridge, Kai, Le Galion, L'Artisan Parfumeur, Lorenzo Villoresi, Mad et Len, Memo Paris, Maison Francis Kurkdjian, Malbrum, Malin+Goetz, Marc-Antoine Barrois**, Maria Candida Gentile, Masque Milano, Mendittorosa, Mona Di Orio, Montale, Montgomery Taylor, Nasomatto, Nebbia, Nishane Istanbul, Nomenclature, Olfactive Studio, Oriza L. Legrand, Ormonde Jayne, Orto Parisi, Parfums Berdoues, Papillon Artisan Perfumes, Parfums Nicolai, Parfums Quartana, Peccato Originale, Penhaligon's, Ramon Monegal, Rania J, Room 1015, Rouge Bunny Rouge, Ricardo Ramos Perfumes, Rubini, Regime des Fleurs, Senteurs D'Orient, Serge Lutens, Slumberhouse, Smell Bent, Six Scents*, Stora Skuggan, Tauerville, Tom Dixon, The Different Company, Timothy Han Edition Perfumes, Thirdman, Von Eusersdorff, Yosh, Xerjoff (incl. Casamorati 1888, Join The Club, Oud Stars, Shooting Stars Collection), Zoologist. Brands: Astier de Villatte*, Acqua di Parma, AERIN, Agraria, Armani Prive, Antica Farmacista, Annick Goutal, Atelier Cologne, Amouage*, Boadicea the Victorious, By Kilian, Chantecaille, Clive Christian, Creed, Christian Dior La Collection Privee, Coqui Coqui, Cire Trudon*, Claus Porto, d'Orsay*, Diptyque, Diana Vreeland, Dr. Vranjes, Edward Bess, Escentric Molecules, EX NIHILO, Givenchy exclusives (Givenchy L'Atelier), Hampton Sun, Houbigant, House of Sillage, Initio, Jean Patou, Jo Malone, Jean Charles Brosseau*, John Derian, Jack Black, Kiehl's, Laura Mercier, Maison Francis Kurkdjian, Montale, Maison Bereto*, Memo, Marc-Antoine Barrois*, Maison Lancome exclusives, Mancera*, Musgo Real, Nest Fragrances, Orlov Paris, Profumi del Forte, Perris Monte Carlo, Roja Dove, R Ramon Monegal, Robert Piguet, Roos & Roos (Dear Rose), Serge Lutens (incl. some non-export fragrances, especially released for Bergdorf), Shalini, Strangelove NYC, The Art of Shaving, Tom Ford Private Blend, The Fragrance Kitchen, Trish McEvoy, Tata Harper, Van Cleef&Arpels Collection Extraordinaire, Volnay*, Yves Saint Laurent Le Vestiaire, Xerjoff*. Besides there's Guerlain' corner with all the exclusive ranges and JAR' corner. Brands: Annick Goutal*, Amouage*, Aedes de Venustas, Agraria, Altaia, Ambra di Venezia, Anat Fritz, Andrée Putman, Astier de Villatte, Attache Moi Parfums, Bella Freud, Byredo, Christian Tortu, Cinnamon Projects, Cire Trudon, Comme des Garcons, Coolife, Costes, COUTEAU DE POCHE, D.R.Harris*, Diptyque**, D.S&Durga, Eau d'Italie, Escentric Molecules, EDWARD BESS, Esteban, Ex Nihilo, Frederic Malle, Fornasetti Profumi, Helmut Lang, Heretic, Hierbas de Ibiza, Isabey, Jack Perfume, J.F.Schwarzlose, Jovoy, Jul et Mad*, Kerosene, Kinski, Liaison de Parfum, L'Artisan, Les Parfums de Rosine**, Ligne St. Barth, Liquides Imaginaires**, Lubin, Maison Francis Kurkdjian, Maitre Parfumeur et Gantier, Maria Christofilis, Marc-Antoine Barrois, MariaLux, Miller et Bertaux, Memo, Mizensir, Mark Birley, Montale**, Naomi Goodsir, Nasomatto, Nomenclature, Odur Parfums, Olfactive Studio*, Ormonde Jayne, Orto Parisi, Penhaligon’s, Room 1015, Roos&Roos (Dear Rose), Santa Maria Novella, Serge Lutens, Santa Eulalia, Shalini, The Different Company*, The Beautiful Mind, Thirdman, Ulrich Lang, Vilhelm Parfumerie. Brands: Anja Rubik, A Lab on Fire, Acqua di Parma, Aedes de Venustas, Aesop, Antica Farmacista, Apothia, Armani Prive, Arquiste, Atkinsons, Attache Moi, Baxter of California, Bois 1920, Boudicca*, Byredo, Carthusia, Chantecaille, Cire Trudon, Comme des Garcons (incl. CdG' series), Costume National, Diptyque, D.S&Durga, Dolce & Gabbana Velvet Collection, Escentric Molecules, Etro, Fornasetti, Frapin, Fresh, Frederic Malle, Gendarme, Givenchy exclusives (Givenchy L'Atelier), Goldfield & Banks, Heeley, Helmut Lang, Heretic Parfums, Inspiritu, i Profumi di Firenze, Illuminum, Jacques Fath, Kai, Kiehl's, Kinski, L'Artisan Parfumeur**, La Parfumerie Moderne, Le Labo, Liquides Imaginaires, Maison Martin Margiela, Maison Bereto*, MALIN+GOETZ, Molton Brown, Nasomatto, Odin, Olfactive Studio, Orto Parisi, Roads, Rodin, Serge Lutens (incl. Serge Lutens Palais Royal Exclusive Collection), Terry de Gunzburg, The Collection by Phuong Dang, The Different Company, The Art of Shaving, The Harmonist, The Laundress, Tiziana Terenzi, Tocca, Tom Ford Neroli Portofino' line, Vilhelm Parfumerie, Yosh. Brands: Arquiste, Amouroud, Amouage, Astier de Villatte, Atelier des Ors, Blend Oud, Carner*, Clive Christian, Chabaud, Collection Croisiere, coolife NYC, Escentric Molecules, Etro, Ex Voto, Fornasetti, Gamine Parfums*, Histoire d'Eaux, Huitieme Art (Collection Noire), Il Profvmo, Indult Parfums, Initio, LM Parfums, Maison Francis Kurkdjian, Mancera, Montale, MEMO, Moresque, Ormonde Jayne, Parfums Nicolai, Parfums Micallef, Parfums MDCI, Pierre Guilaume Parfumerie Generale, Profumum Roma, Parfums de Marly, Phaedon, Roja Dove, Ramon Bejar, Stephane Humbert Lucas 777, Thameen, Tola, Widian by AJ Arabia, Xerjoff. Now Smell This'articles about the shop. Brands: Acqua di Parma, Aerin Candles, Aesop, Agraria, Amouage, Antica Farmacista, Aromatherapy Associates, Armani Prive, ART MEETS ART, Annick Goutal, Antica Farmacista, By Kilian, Bvlgari le Gemme, BYREDO, Bond No 9, C.O. Bigelow, Chantecaille, Cartier Les Heures, Cire Trudon, Creed, Clive Christian, Caron* (incl. Caron 'urns'), Diptyque, D.S. & Durga**, Dior Privee, Dolce & Gabbana Velvet Collection, EX NIHILO, Guerlain exclusives, Givenchy exclusives (Givenchy L'Atelier), Floraiku, Houbigant, HISTOIRES DE PARFUMS**, House of Sillage**, Jack Black, Jo Malone, Jonathan Adler, Kiehl's, LAFCO, Le Labo, Laura Mercier, L'Artisan Parfumeur, Maison Francis Kurkdjian, Molton Brown, Maison Lancome exclusives, Mancera, Malin + Goetz, Montale, Nomenclature, Nest Fragrances, Ormonde Jayne, Penhaligon's, Roja Parfums, Robert Piguet, Serge Lutens Parfums, Terry de Gunzburg, Tata Harper, Trish McEvoy, Tom Ford Private Blend, The Laundress, Tom Dixon, Vilhelm Parfumerie**. Once there used to be Chanel Les Exclusifs. Brands: (MALIN+GOETZ), Aroma M*, Acqua Di Parma, Alvarez Gomez, Ambra di Venezia, Annick Goutal, Antica Farmacista, AQUIESSE, Aromaflage, Aromatherapy Associates London, Baxter of California, Boadicea The Victorious, CB I Hate Perfume, Carner, Caron, Comptoir Sud Pacifique, Cote' Bastide, Creed, D.R.Harris, Etat Libre D'Orange, Fragonard, Feret Parfumer, Geo. F. Trumper, Hampton Sun, Histoires de Parfums**, Hierbas De Ibiza, Hayari*, Hilde Soliani, JEAN PATOU, Jack Black, Jacomo Paris, Jonathan Adler, Juliette Has a Gun, L'Artisan Parfumeur, Ligne St. Barth, Lorenzo Villoresi, Maison Francis Kurkdjian Paris, Miller et Bertaux, Molton Brown, Montale Paris, Nasomatto, NEST Fragrances, Olfactive Studio, Ormonde Jayne, Parfums de Nicolai, Parfums de Marly*, Penhaligon's, Rigaud, Robert Piguet, Santa Maria Novella, The Laundress, Tokyomilk, The Thymes, Tocca. Brands: AETHER, Alvarez Gomez, Amouage, ATELIER BLOEM, BARUTI, Carthusia*, Carner, D.R.Harris*, d'Orsay*, Dr. Vranjes, EDWARD BESS, Frapin*, FORNASETTI PROFUMI, Heeley, Houbigant, J. F. SCHWARZLOSE, Juliette has a Gun, Jul et Mad*, Kerosene Fragrances, LABORATORIO OLFATTIVO, Montale, Mancera, MiN New York Beauty, MEO FUSCIUNI, Perris Monte Carlo, ROSENDO MATEU*, Santi Burgas*, Taylor of Old Bond Street. There also used to be Bois 1920, Keiko Mecheri, Nana M.
Brands: Acqua di Parma, Amouage, Annick Goutal, Arquiste, Bois 1920, Bond No 9, Christophe Laudamiel, Caron, Code Coolife, Courvoisier, Creed, Deco Perfumes, DS & Durga, Escentric Molecules, Elisire, Gamine Parfums, Histoires De Parfums, Imaginary Authors, Incensum Fragrances, Jean Patou, Lilas Perfumes, L'Arc Parfums, Luigi Borrelli Fragrances, Masque Milano, Montale, Neela Vermeire Créations, Nobile 1942, OneOfThose Perfumes, Parfums Delrae, Parfums Quartana, Parfums Jazmin Sarai, Ramon Monegal, Regime des Fleurs, Serendipity 3, Six Scents*, The Merchant of Venice, The Zoo, Zoologist Perfumes. Brands: Acqua di Parma, Acqua di Stresa, Agraria, Acca Kappa*, Bois 1920, Carner, C.O.Bigelow, Carthusia, Comptoir Sud Pacifique, D.R.Harris, Dr Vranjes, Diptyque, D.L&Co, Eight&Bob, Etat Libre d'Orange**, Geo F Trumper, Hayari*, Hotel Costes, i profumi di firenze, Juliette has a Gun, Le Labo**, Laboratory Perfumes, La Compagnie de Provence, La Manufacture, MALIN+GOETZ, Maison Francis Kurkjdian*, Molinard, Nasomatto, Parfums Berdoues, Parfums 06130, Parfums de la Bastide, Robert Piguet, Rodin, Santa Eulalia, The Laundress, Thirdman, Tocca. Brands: 10 Corso Como, Astier de Villatte, Carthusia, Etat Libre d'Orange, Lubin, Laboratory Perfumes, Miller et Bertaux. Brands: At Madison - Agraria, Bastide, Molton Brown, Seda France, Robert Piguet, Santa Maria Novella, The Laundress. At West Street - Agraria, MALIN+GOETZ*, Molton Brown, Robert Piguet, Seda France. Additionally store's website lists Antica Farmacista, Aromaflage, Claus Porto, Geo F Trumper, Jean Patou, LAFCO, Nest Fragrances, Rigaud, Votivo. Brands: Caswell Massey**, Claus Porto, Czech & Speake, D.R.Harris, Geo F. Trumper, Gianna Rose Atelier, Ligne St. Barth, Pre de Provence, Seda France, Santa Maria Novella*, Taylor Of Old Bond, Truefitt & Hill, Yardley. Brands (cosmetic area and Space NK): Annick Goutal*, Acqua di Parma, Amouage, AERIN, Agraria, Antica Farmacista, ARMANI PRIVE, Aromatherapy Associates, Atelier Cologne, Baxter of California, Bon Parfumeur, By Kilian, BVLGARI Le Gemme, Bond No. 9 New York, Chantecaille, CLEAN Reserve, Clive Christian, CREED, Diptyque, Eight and Bob, Erbario Toscano, Escentric Molecules, Frédéric Malle, Guerlain exclusives, Givenchy exclusives (Givenchy L'Atelier), Hampton Sun, House of Sillage, Jean Patou, Jack Black, Jo Malone London, Juliette Has A Gun, Jusbox, Kiehl's Since 1851, L'Artisan Parfumeur, Laura Mercier, Maison Francis Kurkdjian, Maison Lancome exclusives (Grands Crus), MALIN and GOETZ, Mancera, Montale, Nasomatto, NEST Fragrances, Parfums de Marly, Patyka, Penhaligon's, Perris Monte Carlo, The Art of Shaving, The Laundress, Thomas Kosmala, Tom Ford Private Blend, Trish McEvoy, Yves Saint Laurent le Vestiaire des parfums, Voluspa. Brands: Agraria, Antica Farmacista, Archipelago, Caswell&Massey**, Crabtree & Evelyn**, Floris, LAFCO, Molton Brown, Noble Isle, Rigaud, Robert Piguet, Thymes, Voluspa. Brands: at least 19-69 Nineteen Sixty Nine, Heeley, Naomi Goodsir. Brands: 1969 Parfums, Comme des Garcons (incl. CdG' series), Fiele Fragrances, Maison Louis Marie, Regime des Fleurs, Wiener Blut. Brands: Bon Parfumeur, Calypso St. Barth, Child Perfume, Kai, Lollia, Malin + Goetz, Melissa Flagg, Mermaid Beauty, Nest Fragrances, Outremer, Philosophy, Tocca. Brands: Abel, Amanda Lacey, BEHNAZ FRAGRANCE, Fornasetti, Nomenclature, The Scent of Departure*. Brands: 19-69, Aedes de Venustas, Andrea Maack, Comme des Garcons, Cire Trudon, D.S&Durga**, Henrik Vibskov, Maison Louis Marie, Regime des Fleurs, VILHELM PARFUMERIE, Wiener Blut. Brands: Caswell-Massey**, Crabtree&Evelyn, Floris, Manuel Canovas, Penhaligon's*, Rigaud, Robert Piguet*, Thymes, Voluspa. Brands: if still opened - Alora Ambiance, Aesop, Acca Kappa*, Beth Terry, Costume National, Geo F. Trumper, La Maison de Vanille, MANUEL CANOVAS, Molton Brown**, Red Flower, Tocca. Brands: BLOOD CONCEPT*, FOLIE À PLUSIEURS. Brands: 4160 Tuesdays*, Abaton, Acqua di Sardegna, A.N.Other, Bon Parfumeur*, Fiele Fragrances, Gallivant, Gamine, Hi Wildflower, Nobile 1942, Sous le Manteau*, Six Scents*, Yoke. There also used to be Absolument Parfumeur, Andrea Maack, Capsule Perfume, Carlen Parfums, Eight&Bob, Molinard, Parfums Quartana, Paul Schütze, The Zoo, Ulrich Lang. Brands: AESOP, BYREDO, Comme des Garcons, COQUI COQUI, Maison Louis Marie, Rodin, Regime des Fleurs. Brands: Regime des Fleurs, Seda France. Brands: Comme des Garcons (incl. CdG' series), Gendarme, Regime des Fleurs. Brands: Atelier Cologne**, Archipelago Botanicals, Antica Farmacista, Bond No 9, Baxter of California, Child Perfume, Caswell Massey, Crabtree & Evelyn, Claus Porto, Fresh, Gianna Rose, Hampton Sun, Laura Mercier, Lafco, Molton Brown, Royall Fragrances, Robert Piguet, Thymes, The Laundress, The Art of Shaving, Tocca, Tokyo Milk. Brands: Cote Bastide, Lubin*, Lollia, Ortigia, Rodin, Santa Maria Novella, TokyoMilk. 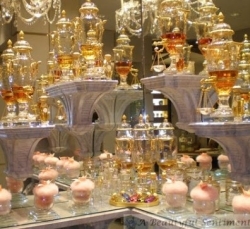 From their website: Scent Elate is a specialty Boutique located in the heart of New York City, Mid Town Manhattan. We focus on scent in its many forms and applications be it practical and or spiritual. We present to you carefully and thoughtfully selected Oils, Lotions, Salts, Candles, Catalytic burners, Incense, Resins, Sage, Palo-Santo and much more for your temple home & body. At least Sarah Horowitz is sold there. Brands: ASTIER DE VILLATTE, Cire Trudon, John Derian. Brands: Amouage, Creed, Hugh Parsons. Brands: at least Carthusia, Hampton Sun, Infusion Organique, Seda France. Brands: Astier de Villatte, Intelligent Nutrients, Mad et Len, Strange Invisible Parfums*, Tata Harper. Brands: Archipelago Botanicals, Claus Porto, DURANCE, Hampton Sun, Rigaud, Seda France, TokyoMilk. Reduced mainstream brands as well as some hard-to-find fragrances. Brands: if still opened, there used to be Eutopie and Oriza L.Legrand. Small and cozy Brooklyn' shop, selling handmade soap, aromatic candles etc. Perfume and cosmetics store at one of the largest outlet centres in the US. Olfactoria wrote about discontinued Tom Ford Private blend' s fragrances, she found there. JFK Airport: By Kilian, Creed, Diptyque, Jo Malone**, The Different Company, The Scent of Departure. Bond No 9 (680 Madison Avenue), closed as it seems. Korres (110 Wooster Street) Closed in autumn 2011. L'Artisan stores (1100, Madison Avenue, 68, Thompson Street, and 222, Columbus Avenue) in 2009. Molton Brown at 1098 3rd Avenue, closed as it seems. Woodley & Bunny (490 Driggs Avenue9 in May 2014. From fall 2014 Henry Bendel (712, 5th Avenue) doesn't stock any third-party beauty brands at his beauty section anymore. Aedes (7 Greenwich Avenue) Moved to 16A Orchard Street by the middle of July 2018.